Schools face a daunting array of challenges including protecting the fragile ears of students (and staff!) 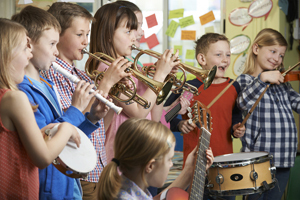 Children today are listening to music practically non-stop, so when they show up for a music lesson, band practice, or shop skills class, they may already have suffered a damaging dose of noise, adding to the epidemic of NIHL (noise induced hearing loss) we are seeing in young people across the world today. At Ear Plug Superstore, we have the tools you need to protect your student's hearing, as well as teach healthy listening habits. And to help you meet the increasingly strict privacy rules, we offer world-class speech privacy systems made for that specific purpose, and at budget-friendly prices. If you need help choosing the right hearing protection or privacy solutions for your staff or students, we are here to help: . TIP: Our Got Ears?® Ultra Lightweight Disposable Stereo Headphones are budget friendly, and for the price, surprisingly high quality headphones that are ideal for schoolroom applications. Here you will find all things related to music: natural sound musicians ear plugs that protect your hearing but still let you enjoy the music at concerts and clubs, headphones, earbuds, in-ear earphones, musicians monitors and more. Ear plugs for children are a great solution for kids ages 3 and up to protect their little ears from water and sound. You will also find flying ear plugs here that help mitigate in-flight pressure changes, which can help little ones endure plane trips much more comfortably. Ear Muffs for Children are often the best choice when it comes to hearing protection for kids. We have chosen several excellent ear muffs that are lightweight and comfortable enough for children, babies and toddlers. Swimming ear bands are designed to prevent moldable ear plugs for swimming from falling out, helping to keep the ears dry during swimming and bathing. Available in a variety of fun colors and sizes to fit adults and children, swimming ear bands are a smart summer accessory for the pool, beach, or lake. Ideal for kids with ear tubes. With cell phones, laptops, and tablets becoming a part of your child's life at an earlier age, there has never been a greater need for earphones designed for children. A smaller size and volume limiting are two features to look for. You will find earphones especially designed for kids here.